Just living life the best that I can; enjoying each moment with my partner of 18 years this November, our two young sons, our Ewoks [Shih Tzu’s] our families & friends. Always trying to appreciate each individual for who they are. Missing our old men waiting for us at the Rainbow Bridge [with Monroe], Gizzy & Hammy – the ‘Puppies’ [Shih Tzu’s] and farewell Loco [cockatiel] enjoy life at your new home! Monroe [our mouse, he graced us with his very very short life] – we will never forget you! I try to find time for my immediate family, my sister, nieces & nephews, in-laws, the rest of our families and our friends. I try to ensure my family has home-made meals at least 4 / 5 nights a week. Gotta love left-overs! Along with my passions for cooking, writing, reading, martial arts, Buddhism, music and Halloween. My newer interests baking and gardening sporadically. [and now I am hooked into genealogy!] However, I am always confronted with the unknowing of my original tribe. This is my way of documenting the path to finding my birth family / MY original tribe. I was adopted, a foundling, with non-identifying information. It has been a surprising and enlightening journey so far. I was raised in a Sicilian Italian home and thought that’s all there was. I have found out my true nationalities through DNA testing. I had no idea of the mix of nationalities that are my core; my top countries of origin include Spain, UK, Dominican Republic, Ireland & Germany; I do have a smidge of Italian as well. Most of my new-found ‘cousins’ are Puerto Rican. So, although I do not know if there are related to me on my paternal or maternal side – one of those sides is Puerto Rican! I am uncovering the ‘rich port’ or Puerto Rico’s history. Originally inhabited by the Taino, it was then claimed for Spain by Christopher Columbus in 1492 and over the next 400 hundred years that it remained a Spanish colony; attempts were made by the Dutch, the French and the British to capture Puerto Rico. I think that explains the rich mix of nationalities that showed up in my DNA results, and so many of my new found cousins. Hmm, and I wonder, being a native New Yorker – a coincidence? It seems I am from one melting pot and living in another. Surprise again to find out I tested to be very slightly Ashkenazi. The more I looked into my new-found DNA matches; I found out that many were also Sephardic. Another fascinating surprise! Makes sense to me; I have always been interested in finding out about other cultures, religions, languages. I have tested with 23andme and FTDNA. 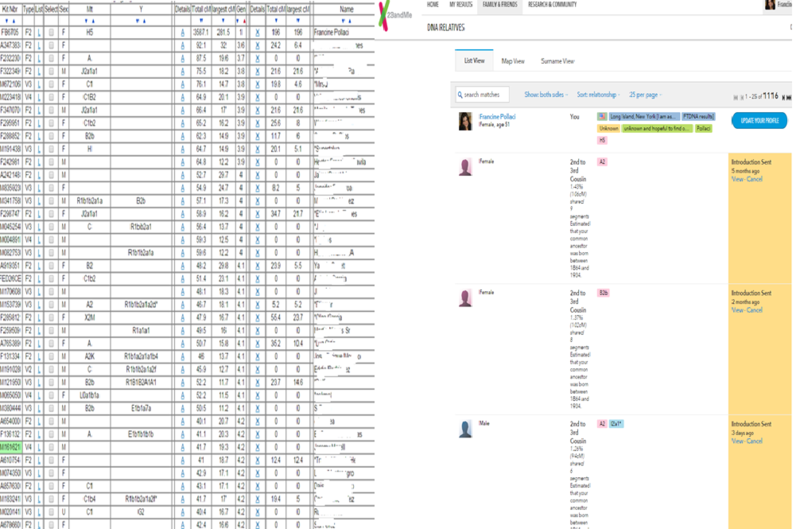 I have downloaded my information to gedmatch.com & DNAgedcom.com. Everyday my understanding DNA jargon etcetera increases. However, I am sooo far from an in-depth understanding; it keep me up nights as I try to put the pieces of my puzzle together. I have been fortunate; many of my newly found DNA cousins have been forthcoming with information and assistance, some even mentoring me in my understanding of how DNA works and how we might be connected. At present, I am building my own kind of family tree; compiling information from ‘DNA Matches’ and adding in their grandparents, great grandparents, great great grandparents, etc. looking for some common denominator. I continue to reach out; especially when I experience a DNA epiphany. Thanks for following me. Looking forward to sharing in your journey. Thanks! I look forward to your writings! I guess living in Homer really does bring out your creative side!! Thanks for stopping by the site and the like! thanks. New to wordpress blogging! Very interesting successful journey to find your family. I am very inspired and it will make me motivated to search some of my possible lost close relatives that I will continue searching. Joe – keep me posted on how your tree develops! !